This is the section of the Pembrokeshire Coast path where the trail becomes more rugged and remote. Completing the 66 miles / 106 km in 5 days will be exhilarating and challenging walking across the most beautiful and dramatic cliff top paths of this coastal path. The Cathedral, Snaking Cliffs and a Big Finish! This section begins in Britain’s smallest city of St David’s with it’s beautiful cathedral. Make time to linger on the wild and rocky peninsular of St David’s Head which abounds with archaeology and has views across to Ramsey Island. Keep an eye out too for seals in the rocky coves below the path and gannets diving for fish out to sea; you may be lucky enough to see the grey dorsal fins of porpoises hunting for fish beneath the gannets. The section between Whitesands and Abereiddi feels wild and remote with hardly a building to be seen making the cafe at Whitesands or the refreshment van at Abereiddi a welcome sight for the weary walker! This is an exhilarating and in places rugged section of path above high cliffs and beneath the dramatic craggy volcanic outcrops of Pen Beri, Carn Lleithyr and Carn Llidi. This is not a technically difficult walk and should be easy to tackle for most reasonably fit people. The paths are good, and there are no major route finding challenges. This northern section contains the hilliest parts on the entire route. How Much Up & Down? More than you'd think! Although you never reach more than 200m above sea level there are many short steep sections. Most days involve ascents of 200-500m metres, although no section is very steep for very long. By Air: The nearest airports are Cardiff and Bristol – International airports are London, Birmingham and Manchester. You can then travel by public transport to St David’s. 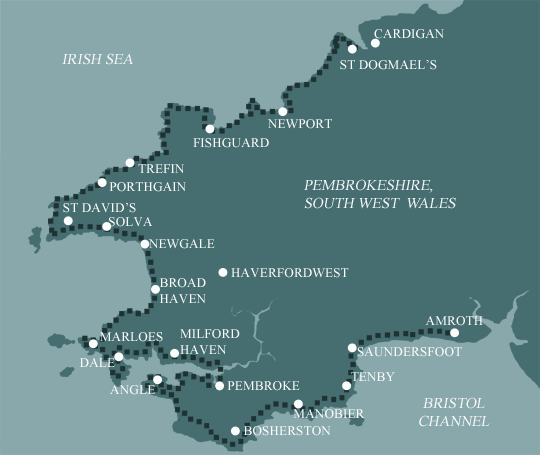 By train from London (6-7 hours) via Newport and Haverfordwest then bus to St David’s. By coach National Express from London to Haverfordwest then bus (Provider:Richards Bros 342) to St David’s (16 miles).